I have a few friends who are snobs when it comes to gym attire, but seriously, you’re going running in this get-up?! Oh, I do miss Michael Jackson because he’s the only person I thought of when I asked myself who would workout in this outfit. It might not look like it, but Lucas Hugh has definitely taken exercise into account when designing the Prince Albert running jacket (wind-proof with a headphone eyelet at the lapel) and Dial Capri leggings (ventilated panels). The jacket, with belted closure, is more of a coat, strictly for jogging on brisk days. With all those eye-catching, light-reflecting, high-visibility panels, I guess you won’t have to worry about getting hit by a car – everyone will take notice, for sure. And you have a guarantee that nobody will out-snob you at the gym. A retro-futuristic steampunk look, this is for the flashiest of gym rats and the superhero in you. Who knows? Maybe it will have you pumping iron like one, too. 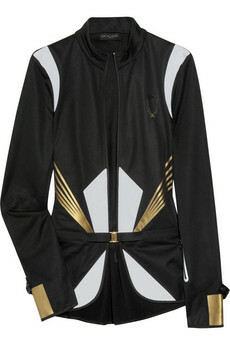 Prince Albert Performance Running Jacket on Net-a-Porter for $455. 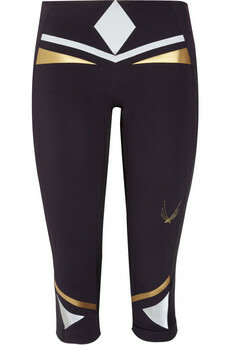 Dial Stretch Capri Leggings on Net-a-Porter for $245.